Restarting your computer is the well known ideal procedure to restore and increase the speed and performance of the computer back to normal form, which kills the currently running process and frees up the temporary data stored in RAM. However you won't restart every time to restore the speed back, so you then became familiar with the sluggish computer and continue to work with the slow speed. But since restart terminates all the currently opened application, you may not know what are the application used earlier for some specific purposes and also waiting for the system to restart every time to attain the actual speed would be a frustrating one. Whenever an activity is carried out on a computer, RAM keeps the application temporary data's until the next restart, so even if you have a RAM chip with TB of storage capacity, after heavy hour's of continuous usage, the RAM might be overwhelming with temporary data's, so when it exceed the limit, it causes the computer to slow down subsequently. There is a myth that closing the running application will increase the computer speed, but just closing the active application will not boost the speed of the computer, because whenever an application is opened, it's registry files and temporary data's were stored in the RAM temporarily, and removed automatically at the next restart. so until the computer gets restarted the temporary data's remains in the RAM which causes the computer to slow down. How to refresh RAM memory for better performance ? So now we know that RAM is the one factor to slow down your computer, that renders slow speed than it could. Then how can we remove the temporary data's/Junk files and refresh the RAM to retain its speed. Just follow these simple procedures to make your computer performs better like you just bought a new computer. Immediately a window prompts to enter the item location for what item the shortcut created for. 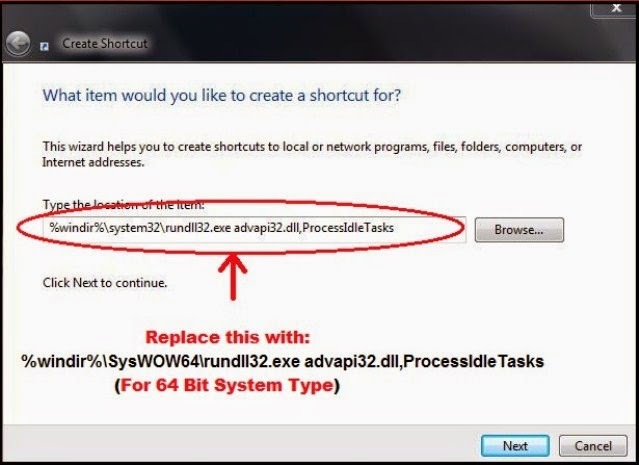 Type (or) copy and paste the below code corresponding with your computer operating system bit variant either 32 or 64 bit. Click next and type any name for your shortcut file and Click FINISH. And you're done, open the shortcut file to refresh RAM memory whenever you feel your computer is slowing down because of application junk/temporary data. Note: Refreshing RAM with this method will terminate any inactive process and clear's temporary data's stored to create free space and boost computer speed, hence It doesn't affect any active application and recent download location/files.